Within this social turn we see new academic dialogues and design research activities; the rise of designers and design agencies providing services to specific clients within the societal context; and an increasing involvement of professionals and citizens who (knowingly or unknowingly) apply design thinking, processes and approaches.6 These dialogues have coalesced around two centres of discourse, ‘design activism’ and ‘social design’. This essay examines the framing of these discourses, practices and their teleological orientations to raise questions about their agency and potentiality to challenge our habitus,7 generate alternatives and create positive societal change. My first observation is that social design embraces a range of terminology including design for society, socially responsible design, socially responsive design, and design for social innovation, perhaps, in an attempt to sound less totalitarian and politically motivated as in ‘social design’ i.e. ‘designing society’. Analysing the key words of the definitions, I created two ‘wordles’, one for design activism and the other for social design (Figures 1 and 2). There are four prominent words for design activism ‘change, social’ then ‘life, practice’. There is a hierarchy of prominent words for social design, starting with ‘development, social’, followed by ‘socially’, then ‘economic, good, government, human, local, practices, providers, solutions’. The structuring of language already seems more developed in social design to the extent that it identifies certain contextual elements such as key stakeholders (government, providers), pragmatic framing (development, economic, solutions, practices) combined with moral intentions and approaches (social, socially, human, good). Activists appear in both of my wordles but, interestingly activists do not appear in three wordles recently included in a major European research study, TEPSIE,14 defining social innovation and its practices. 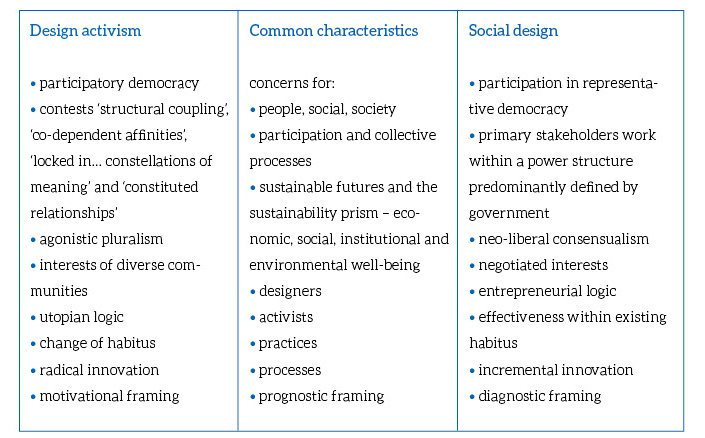 Further exploration of these mini-lexicons from these sourced definitions of design activism and social design reveals some key characteristics in specific areas of focus (Table 1). In general, the main institutional and societal stakeholders are common to both design sub-fields, but social design specifies roles for various identified professionals – experts, facilitators, designers – with ‘others’, including users and ‘non-designers’. For design activism the issues range across society, whereas the remit of social design seems more aligned with dominant political structures, policies, economic development and for the ‘social good’. Contextually, design activism is grounded in proposing, seeking and developing ‘alternatives’, whereas the context of social design is driven by the agendas of the key stakeholders, especially the government, providers (of services, products, materials) and grass root innovators. The attitudes and activities of social design have an underlying pragmatism, looking for effective outputs, capacity building and to developing capabilities and wise use of assets. In contrast, design activism reveals an ideological, experimental and more radical remit around contestation and asks, What could be? This is carried through to the outputs which strive for the means to encourage a better and different society based on new visions, beliefs, values and the forging of new ‘norms’ as outcomes. Social design absorbs grass roots innovations into new policies and professional practices in order to develop these innovations within the institutions. The key aim is about creating a social economy for the public and social good. Table 1. Comparing key language characteristics and orientation of design activism with social design. Table 2. The framing of design activism and social design. This language reveals some common characteristics for design activism and social design based on prognostic framing (Table 2). This framing helps identify alternatives by asking who can solve the problems and what can be done. It brings people together to participate in collective processes asking how we deal with sustainability challenges, particularly from a social sustainability perspective. However, further examination of the framing for design activism reveals some substantive differences. Design activism is not structurally coupled to economic/local/sustainable development. It contests the paradigmatic ‘structural coupling’, ‘co-dependent affinities’ and ‘locked-in’ ‘constellations of meaning’.15 Design activists are free to choose their focal issues and the type of power structures they work with, for or against. They are free to work with diverse communities – of practice, place, interest or circumstance – in a pluralist and agonist agenda which is shaped by participatory, not representative, democracy. Design activism is expressed in pluralistic, utopian and agonistic disruptions of habitus. The propositions are poly-teleological and aimed at diversifying our habitus. Its framing is highly motivational and a call to action(-ing). Its focus is radical change. Social design is framed in representative democracy, entrepreneurial logic, diagnostic framing — What is the problem? Who is responsible? —, prevalent power structures, and effectiveness through neo-liberal consensual-ism. Social design appears more constricted as it is underpinned by a pre-defined purpose — public and social good within a neo-liberal agenda — configured by the primary funders and driving organisations. Any alternatives it generates will only be ‘scaled up’ (to use a phrase gaining traction in social innovation discourse) if they align with the telos of this agenda. Consequently, it is difficult to see how it can offer more than incremental innovation to pressing social needs. Social design’s latent agency is constricted by existing power relations. It is not contesting our habitus, but seeks to effectuate society’s capacity to act in the current neo-liberal paradigm of economic growth. In contrast, design activism has significant freedoms to apply itself to re-assembling, re-association,16 making new relations, and re-coding products, services and experiences in order to create ‘alternatives’ which challenge existing power structures and relations. Design activism hints at more polycentric governance and so, consequently, it is a direct challenge to the dominant power structures. 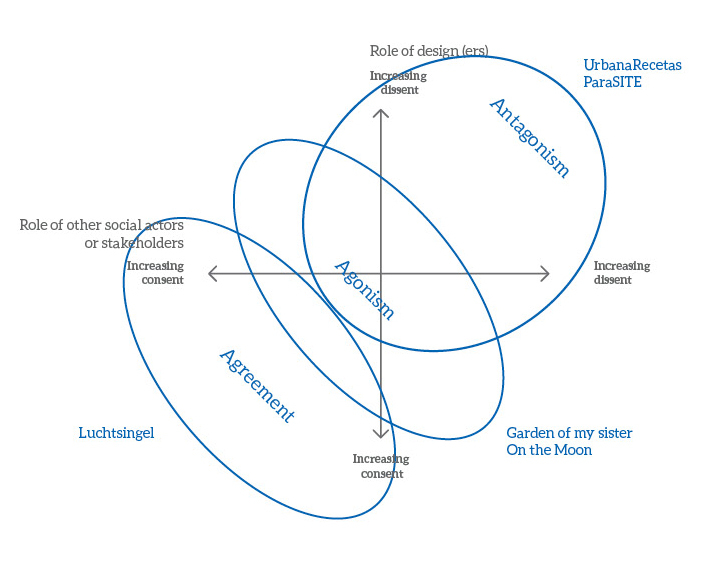 The teleological orientations of design activism and social design mean that consensus and dissensus tend to be applied in different ways17 (Figure 3). The overall telos of social design is achieving consensus through the organisational structures, norms and practices of the key stakeholders. Dissensus tends to occur in dialogue, not in the actions or materialisations of design(-ing), and it must comply with accepted institutional cultural practices and language. Social design is, perhaps, therefore limited to expressions of ‘weak agonism’ because it needs agreement to effectuate change (Figure 3). Figure 3. Designers and other stakeholders can take consensual or dissensual roles to generate agreement, agonism and/or antagonism depending upon the telos of their action or project. Design activism is not bounded by such constraints and, indeed, has a history of applying practices designed to provoke (antagonise) and to create dialogue and positions of contestation (agonism), but it can also encourage consensus (agreement). These practices not only involve an understanding of the problématique and the ideation of concepts, but the insertion of ‘one-off’ materialised designs or practices into different socio-spatial environments. 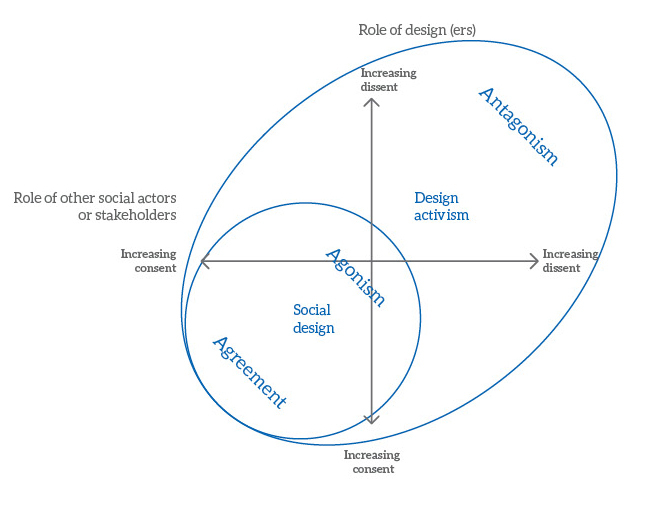 Design activists can adopt the position of ‘non-aligned social broker’ to undertake maverick, solo or collective interventions.18 Of course, social design applies the practice of ‘prototyping’ new services and other interventions, but its potential agency is restricted by its weak agonism and caution against provocation because of its underlying framing of representative democracy — it doesn’t pay to antagonise the people while trying to represent and serve them. This might explain why we are seeing a proliferation of ‘pop-up’ designs and interventions in cities19 that are being permitted, or at least not banned, by city municipalities because they wish to see the effects of this experimentation while not being directly responsible for it. Recently it has been observed that some of the challenging interventions made within the World Design Capital 2012, held in Helsinki, Finland, are being rapidly absorbed, adopted and adapted by the city municipalities themselves.20 This can be seen as socially progressive and, indeed, Helsinki City has recently appointed three ‘city designers’ to explore how design could better serve the citizens. Let’s see how this evolves. So, the latent agency of design activism, resulting from its teleological freedoms, enables it to challenge our existing social ‘material and expressive assemblages’21 and suggest rich possibilities of re-association, re-assembly and posit new relations through design(-ing) as a means to imagine and enact social change in everyday life practices. Gasper Mallol refers to ‘design f(r)ictions’ as micro-situations of dissent.22 ‘Fictions’ should be understood as projections, and ‘frictions’ as irritations, ‘in order to fabulate the commonplace’. Her word ‘commonplace’ can be translated as meaning ubiquitous social material assemblies which we share and encounter every day. I believe design activists can offer a potent contribution to developing counter-narratives, counter-dialogues and counter-actions which reframe everyday problems as possibilities. Let me demonstrate this sense of agency with some existing examples contesting how we design in public space (Figure 4). 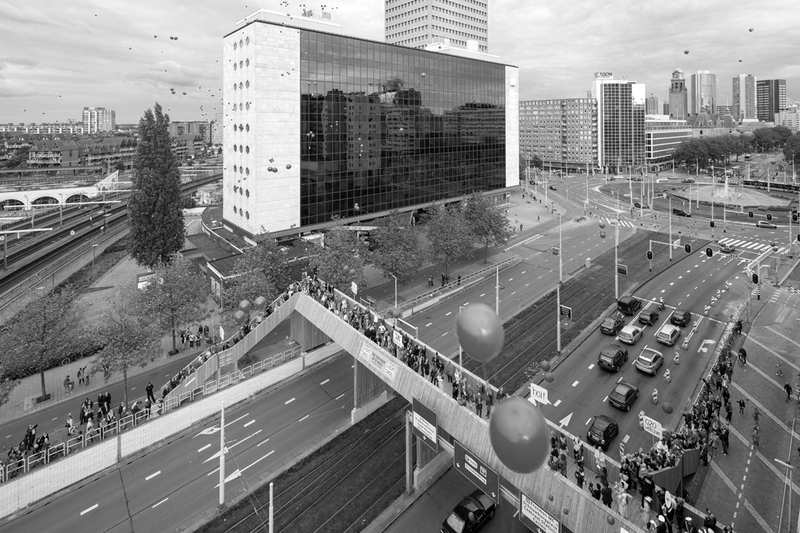 Initiated and designed by Zones Urbaines Sensibles (ZUS),23 Luchtsingel is a 350 metre pedestrian bridge which re-connects Rotterdam Central District with the Hofbogen in Rotterdam, the Netherlands (Figure 5). The project is phased over several years, but the first phase was completed in 2012 as part of a wider programme called I Make Rotterdam, an initiative of the International Architecture Biennale Rotterdam to explore more participatory ways of city-making. Luchtsingel attracted 1300 participants who crowd funded the construction, with each contributor’s name appearing on planks or components of the wooden bridge. Involvement and consensus are at the heart of this project, but is an action intended to positively disrupt the local environs. Figure 4. Examples of design activism as ‘spatial agency’. Figure 5. Luchtsingel by ZUS, Rotterdam – the opening day. © Ossip van Duivenbode. My second case study involves the French direct-action architectural organisation called Collectif Etc,24 formed in 2009. Their projects are numerous, but all involve engaging professionals and citizens in challenging the vertical power structures of contemporary urban space and its planning. 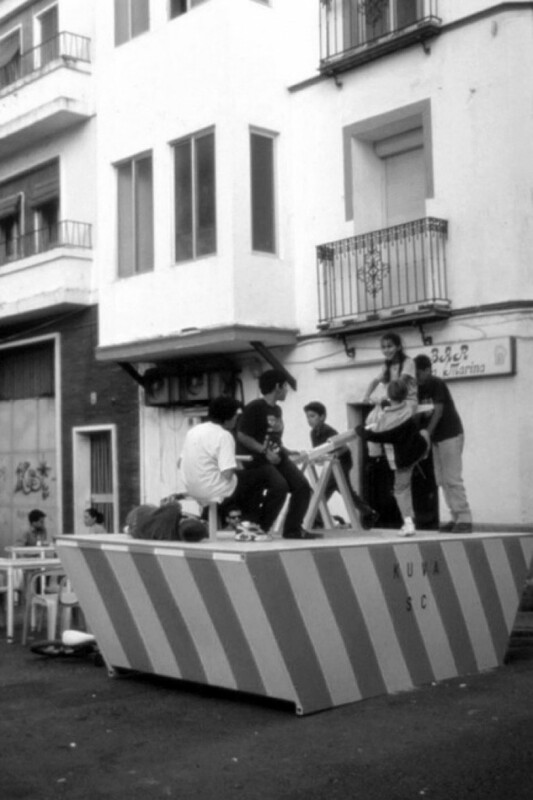 They express themselves through the construction of built interventions, street furniture, organisation of meetings and conferences, training workshops, or more artistic interventions (display devices, sculptures, installations). In 2012, they organised the ‘Detour de France’ along the theme of ‘the civic fabric of the city’, where a group of architects cycled around the country dropping into communities and co-building interventions in public space. These were consensual yet agonist, because they raised serious questions about the legal, civic and other issues of public space. Most interventions were part of on-going projects by existing organisations. 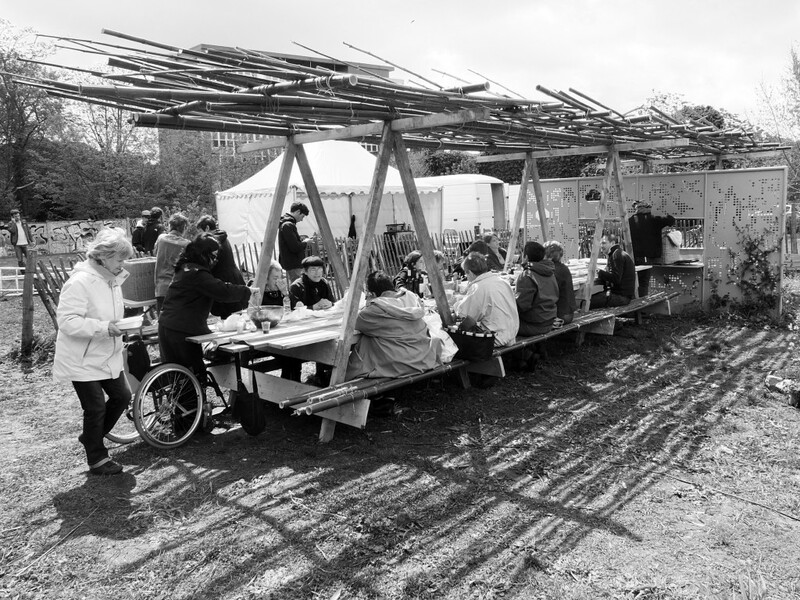 For example, the building of a public picnic bench in bamboo and wood in Le Jardin de Ma Soeur/The Garden of My Sister on wasteland in Bordeaux (Figure 6). Collectif Etc, members of the garden, a local social group, young people, the Directorate of Parks, Gardens and Rivers and local inhabitants co-built the bench. The reclamation of mine wasteland in the city of Darcy, Les Beaux Monts D’Henin – Les Saprophytes, where the site was directly occupied and the local community galvanised to action under the project title On the Moon (Figure 7). Geodesic buildings and a stairway-come-slide-come-rocket launcher were installed and special community events arranged. They created new perceptions and possibilities for the inhabitants, while raising debate about the near-future planning for these types of civic places that the municipalities have insufficient resources to develop in conventional ways. Figure 6. An intervention by Collectif Etc in The Garden of My Sister, Bordeaux. © Collectif Etc. Figure 7. 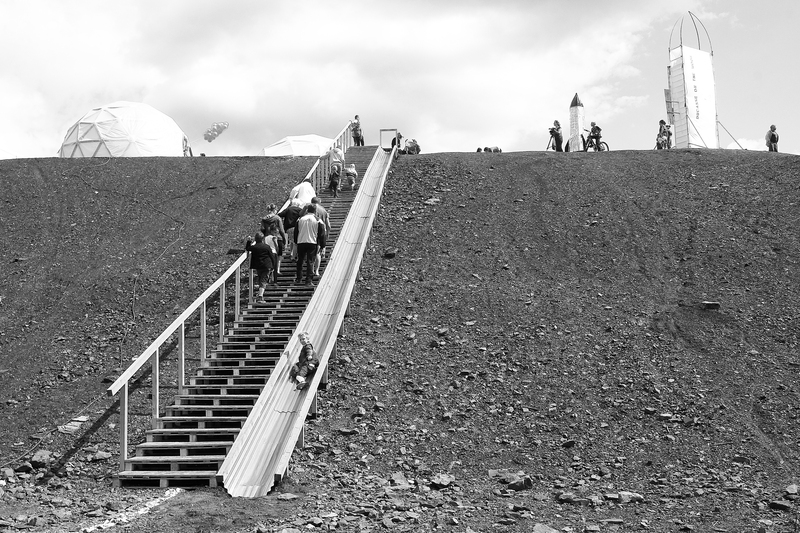 An intervention by Collectif Etc on the waste hills at Darcy for the project ‘On the Moon’. © Collectif Etc. Figure 8. Recetas Urbanas (Urban Recipes) © Santiago Cirugeda. The agency displayed in these case studies of design activism invokes a range of consensual and dissensual activities, at times invoking agreement, agonism and antagonism, but always consistent in the presentation of counter-narratives, counter-dialogues and counter-actions. I think the teleological freedoms of design activism give it licence to explore and probe areas of inquiry that social design might find difficult to go to. For example, we need much more discourse on re-establishing more symbiotic relationships with nature, a ‘sympoiesis’.26 Perhaps, the emergence of ‘bio design’ as a sub-field27 of design provides some focus here, although we should be careful to differentiate between design activists and designers working within the ethical constraints of the technologists and scientists. Better ways of living with nature are especially important as population experts predict that up to 60% of people will live in cities by 2030 and 70% by 205028 continuing the urbanisation trend of the last 300 years and further distancing us from experiencing a natural, as opposed to a ‘human-made’ environment. As Jane Bennett pointed out in her book Vibrant Matter,29 a more holistic view of materialisation and removal of binary divisions such as human/nature, living/non-living might help us re-think what it means to sustain our lives and build resilient eco-systems, now and in the future. Design activists are certainly questioning how we can and might have to re-relate with food and its production.30 Those exploring energy generation and conservation, medicine and architecture are challenging our relations with living components. We also know, from recent events in the global economy, that the vast majority of wealth generated during the recovery of national economies is going to the already wealthy people while ordinary citizens’ assets and financial prospects are diminishing.31 Such inequality reveals a serious structural imbalance in governance and fiscal mechanisms. In southern Europe, hit hard by the economic crash of 2008/9, we are witnessing a surge of alternative, often non-monetary, exchange systems, such as time banks, community initiatives and local ‘transition’ currencies.32 These are, perhaps, reflex responses to economic systems that are failing large numbers of people. They involve different forms of exchange, sharing, co-operation and mutualism based on new relationships. This re-relationing is underpinned with emergent new values. We should be raising questions as design activists as to how we can help with these processes — how can we contribute to the growth of ‘alternative economies’ and developing Our Commons,33 or what Elinor Ostrom, in 1990, defined as our ‘common-pool resources’.34 We have some emerging signals from the open design movement,35 from the activities of architects seeking new forms of spatial agency,36 and from the contributors in this book, as to the direction our investigations, provocations and collective actions can take. Those applying design(-ing) need to be cognisant with how they can contribute to alternative models of enterprise which embed equity in the relationships between the stakeholders, human and non-human. They also have to be aware that language and actions of the activists are easily appropriated by neo-liberal forces, so it is essential that design activists are seen as a non-aligned social broker, independent of political power structures and capable of contributing to a positive culture of dissensus.37 This raises questions of how design activists might encourage people to participate in the discourse and acts of dissent. Yanki Lee sees Participatory Design (PD) as being firmly linked with present day meanings of innovation, but Design Participation (DP) as ‘a way of thinking about design’ and its wider roles in society.38 She states that DP can be understood as ‘paralogy’, explained by the philosopher, sociologist and literary theorist Jean-Francois Lyotard as ‘Paralogy must be distinguished from innovation: the latter is under the command of the system, or at least used by it to improve its efficiency; the former is a move (the importance of which is not recognised until later) played in the pragmatics of knowledge. The stronger the ‘move’; the more likely it is to be denied the minimum consensus, precisely because it changes the rules of the game upon which the consensus has been based.’ This suggests design activism is paralogic and that social design is tied to efficacious, incremental innovation that leaves the command of the system intact. While I have positioned design activism as having teleological freedoms beyond that of the current remit of social design, the activist will undoubtedly find actors and stakeholders from both arenas which he/she can help to smartly re-combine existing resources towards designing preferred situations.39 However, for me, a central tenet of design activism is that it simultaneously addresses societal issues of concern while changing the essence of what it means to design. These mutual activities will help answer Tomás Maldonado’s call for design to develop a lucid critical social and ecological consciousness to address contingent realities.40 He made this call forty years ago. It is time that the design activists made their ‘moves’ to create a critical mass to positively disrupt our habitus. 1 I use the term ‘field’ here to denote a ‘field of study’ with its own body and theory of knowledge, definitions, language, cultural conventions and way of knowing and validating, i.e. its own epistemological position. 2 We can see that this ‘socialisation’ has been driven by the shift, over the last two decades, from a focus on materials, artefacts and spatial expressions of design(-ing) towards more conceptual and/or ideological goals where the application of design thinking, participation and processes are integrated by involving diverse actors and stakeholders within an inter-disciplinary environment. 3 Fuad-Luke, A., 2014. Design(-ing) for Radical Relationality: ‘Relational design’ for confronting dangerous, concurrent, contingent realities. In: Emerging Practices in Design. Professions, Values and Approaches. Shanghai: Tongji University Press, pp.42-73. 4 Manzini, E., 2015. Design, when Everybody Designs. An Introduction to Design for Social Innovation. Cambridge, MA: The MIT Press. 5 Here the work of philosopher and political theorist Chantal Mouffe and her framing of ‘agonistic pluralism’ defines what politics is and is not. For Mouffe ‘‘politics’… ‘indicates an ensemble of practices, discourses and institutions which seek to establish a certain order and organise human coexistence in conditions that are always potentially conflictual because they are affected by the dimension of ‘the political’ ’ where the latter is seen as ‘the dimension of antagonism that is inherent in human relations, antagonism that can take many forms and emerge in different type of social relations’. See Mouffe, C., 2000. Deliberative Democracy or Agonistic Pluralism. Reihe Politikwissenschaft, Political Science Series, Vienna: Institut für Höhere Studien (HIS)/Institute for Advanced Studies, p.15. 6 See the definition of design activism in Fuad-Luke, A. 2009. Design Activism. London: Earthscan. p.27. 7 ‘Habitus’ is a term applied by philosophers (originally attributed to Aristotle, but developed by Bourdieu, Weber and others), phenomenologists (Husserl, Merleau-Ponty) and sociologists (Mauss, Weber) to denote the structuring of the mind by non-discursive knowledge i.e. by its learned habits, one’s bodily skills, and by the cultural forces of taste and style. In short, we can change our habitus if we, or something, changes our worldview. 8 Scott, J. and Gordon, M., eds. 1998. A Dictionary of Sociology. Oxford: Oxford University Press. 9 Wood, J., 2013. Meta-designing Paradigm Change: An Ecomimetic, Language-Centred Approach. In: Walker, S. and Giard, J., eds. 2013. The Handbook of Design for Sustainability, London: Bloomsbury. pp.428-445. 10 ‘Sustainism’-is a concept coined by Michiel Schwarz and Joost Elffers describing the relations between ‘global connectivity, sustainability, open exchange, and resurgence of the local.’ Schwartz, M. and Krabbendam, D. 2013. Sustainist Design Guide, Amsterdam: BIS Publishers. p.19. 11 ‘Sustainment (the overcoming of the unsustainable)’ in Fry, T., 2011. Design and Politics. Oxford/New York: Berg. p.viii. 12 Deutscher, G., 2011. Through the Language Glass. Why the world looks different in other languages. London: Arrow Books. 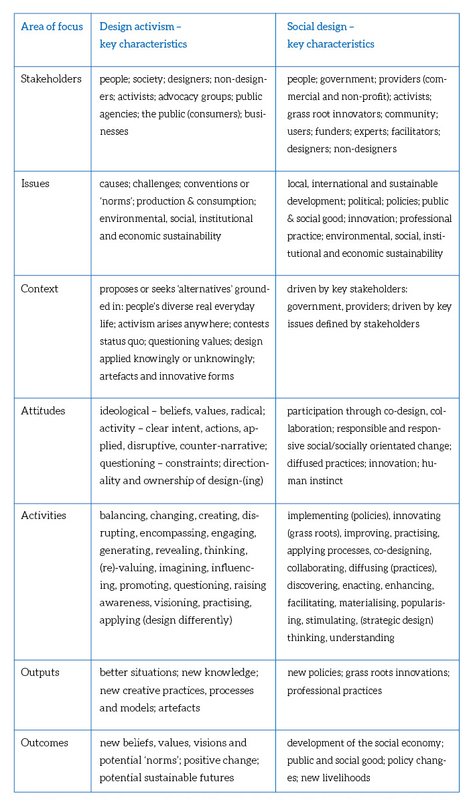 13 For my analysis I took definitions of ‘design activism’ from the following sources: Chick, A. and Micklethwaite, P., 2011, Design for Sustainable Change. How design and designers can drive the sustainability agenda, AVA Publishing: Lausanne. p.59; Fuad-Luke, A., 2009. Design Activism. Beautiful Strangeness for a Sustainable World. London: Earthscan. p. 27; Leeds Festival of Design Activism, 2009, available at http://www.designactivism.org; Markussen, T., 2011. The Disruptive Aesthetics of Design Activism: Enacting Design Between Art and Politics. In: Nordes ’11: the 4th Nordic Design Research Conference, Making Design Matter!, 29-31 May 2011, School of Art and Design, Aalto University, Helsinki. pp. 102-110. Available at www.nordes.org; Thorpe, A., 2008. Design as Activism: A conceptual tool. In: Peruccio, C. and Peruccio, P. eds. 2008. Changing the Change Proceedings. Changing the Change conference, Turin, Italy, June 2008. pp.1523-1535. Available at http://www.changingthechange.org/papers/ctc.pdf; Thorpe, A., 2008-2012. Design activism. Available at http://www.designactivism.net. 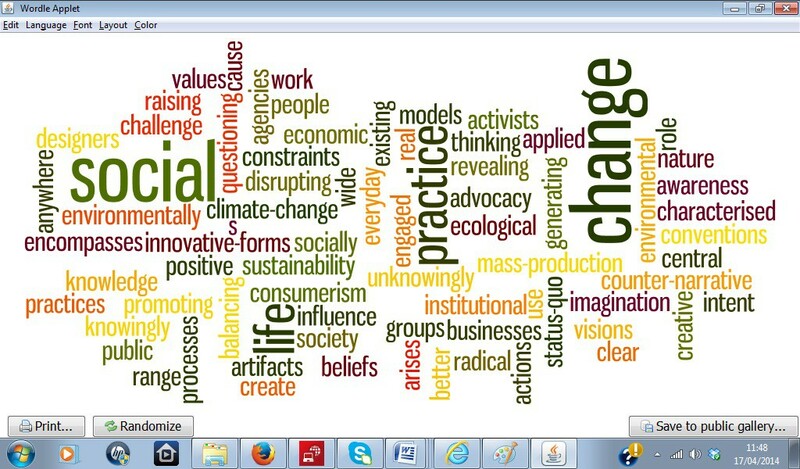 14 The first wordle emphasises ‘new, changes, definition, dimension, needs, economic, process, dimension’ (Part I, p.10); the second wordle on ‘social innovation’ highlights ‘social, public, sector, innovation’ (Part II, p.5); and the third wordle, on ‘social innovation trends’, stresses ‘new, people, services, problems, thinking, open’. Source: Caulier-Grice, J., Davies, A., Patrick, R., and Norman, W. 2012. 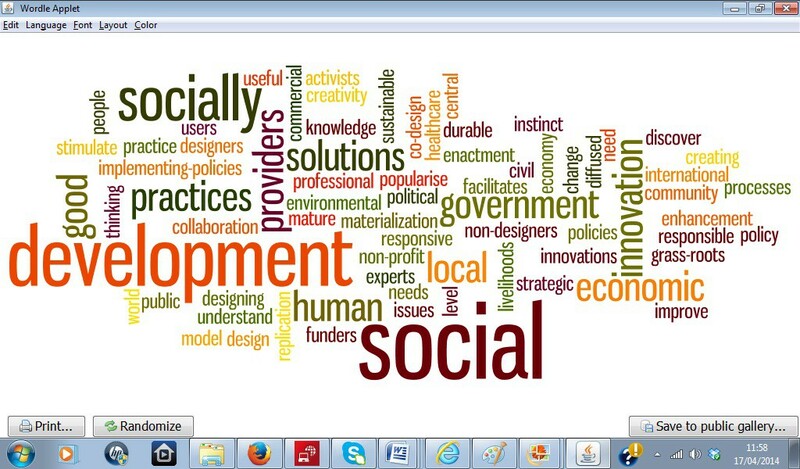 Defining Social Innovation. A deliverable of the project: ‘The theoretical, empirical and policy foundations for building social innovation in Europe‘, (TEPSIE), European Commission – 7th Framework Programme, Brussels: European Commission, DG Research. 15 These terms refer to existing power structures. See ibid. Wood. 2013. Wood refers to ‘co-dependent affinities’, where the existence of the car/automobile creates many affinities, such as ‘rapid response/hospitals, roads/taxation, out-of-town/supermarkets and so on’, which as a phenomenon is described as ‘structural coupling’ by Maturana and Varela, 1980 cited in his article. In the same compendium, Knowles et al. refer to cyber-sustainability and near-future web developments as being already ‘locked in…constellations of meaning’. See Knowles, B., Walker, S. and Blair, L., 2013. Design for Cyber-Sustainability: Toward a Sustainable Digital Future. In: Walker, S. and Giaard. J. eds. The Handbook of Design for Sustainability. London: Bloomsbury. pp.488-512. 16 I borrow the terms ‘reassembling’ and ‘re-association’ from Bruno Latour who used these words to expand the meaning of the word ‘social’ as a ‘particular sort of thing, but only as a very peculiar movement of re-association and reassembling’. Labour, B.2007. Reassembling the Social. An introduction to Actor-Network- Theory. Oxford: Oxford University Press. p.7. 17 In 2012, I developed this framework for showing the roles of the designers and other stakeholders in terms of consensus and dissensus, and first presented it at a keynote talk entitled ’Design(ing) for Transition and contingent eco-socio-political realities’ at the U Design ’12 conference organised by ID+ research group of the University of Aveiro and the University of Porto, Aveiro, Portugal on 14 July 2012. 18 Fuad-Luke, 2009, ibid, p.xxi. 20 See the Special Issue on ‘design activism’ in Design and Culture, July 2013, especially Bergland, E., Design as Activism in Helsinki: Notes from the World Design Capital 2012, pp. 195-214; and Julier, G. From Design Culture to Design Activism, pp.215-236. 21 ‘Material and expressive assemblages’ is drawn from assemblage theory from the work of Gilles Deleuze and Felix Guarttari, later further developed by Manuel De Landa. An assemblage is based on the concept of exteriority, that any one component of the assemblage can be unplugged and inserted into another while maintaining its identity. The ‘material’ refers to content and the ‘expressive’ to the roles components can play. For further reading explore: Deleuze, G., and Guattari, F., 2000 (1980). A Thousand Plateaus: Vol 2 Capitalism and Schizophrenia. Brian Massumi. London and New York: Continuum; De Landa, M., 2006. A New Philosophy of Society: Assemblage Theory and Social Complexity. London and New York: Continuum. 22 Gaspar Mallol, M.,2011. F(r)ictions. Design as Cultural Form of Dissent. Paper presented at Design Activism and Social Change conference, organised by the Design History Society, 7-10 September, Barcelona, Spain. 26 Ibid. Wood. 2013. p.439, Nieuwenjuijze and Wood, 2006, define ‘sympoiesis’ as ‘the more profound stages of co-authorship within team building and in maintaining symbiotic relations’. Here I suggest that ‘humans’ and ‘nature’ can have a sympoiesis to heal the split which has been created by a dominant technologically driven economic growth paradigm which places humans in a largely artificial, synthetic, human-made environment to the exclusion, or exploitation, of nature. 27 See, for example, Myers, W., 2012. Bio Design. Nature, Science, Creativity. Thames and Hudson: London. 29 Bennett, J., 2010. Vibrant Matter. A Political Ecology of Things. Durham and London: Duke University Press. 30 See, for example, the biohackers, biomimeticists, urban design agriculturalists and food phreakers at Next Nature, http://www.nextnature.net; Futurefarmers, http://www.futurefarmers.com; and the Centre for Genomic Gastronomy, http://genomicgastronomy.com. 34 Elinor Ostrom created 18 design principles for governing our commons, i.e. common-pool resources; these were recently extended with seven new principles for our global resource commons by Paul Stern. Stern, P. C., 2011. Design principles for global commons: natural resources and emerging technologies. International Journal of the Commons, 5(2), August 2011, pp.213-232. 35 See van Abel, B., Evers L., Klaassen R. and Troxler, P., 2011, Open Design Now. Why Design Cannot Remain Exclusive. BIS Publishers: Amsterdam. 36 See Awan, N., Schneider, T. and Till, J., 2011. Spatial Agency. Other Ways of Doing Architecture. London: Routledge. 37 In his book, The Three Ecologies, originally published in 1989 in French, Felix Guattari wrote about the need for cultivating a dissensus. 38 Lee, Y., 2007. What are the social responsibilities of designers? Investigating new perspectives for design participation. Paper presented at IASDR07, International Association of Societies of Design Research, The Hong Kong Polytechnic University, 12th to 15th November 2007. 39 Invoking Herbert Simon’s observation in his 1969 book, Sciences of the Artificial, that design is applied to change existing situations into preferred situations. 40 Maldonado, T., 1972. Design, Nature and Revolution. Toward a Critical Ecology. Translated from Italian by Mario Domandi. New York: Harper & Row. p.50.